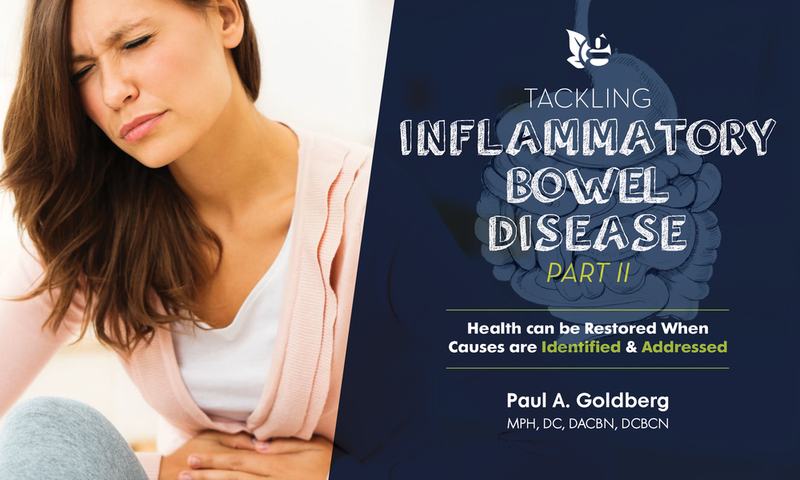 The number of people in the United States suffering with some variation of Inflammatory Bowel Disease (IBD) continues to increase rapidly, as does the prevalence of autoimmune disorders in general. Those seeking medical care for these issues find themselves on a never ending trail of toxic drugs, surgeries and misery. The ongoing failure to provide real help to the legions of sufferers leads us to the inevitable conclusion that methods employed by Medical and Alternative Medical Practitioners do not address the core causal factors producing these disease states and are failing patients desperate for help with life altering conditions. Genetics, infection, autoimmune mechanisms, environmental factors and psychological elements are intertwined as part of the scenario in most IBD cases. Individual reasons for these problems are, however, highly diverse, a fact the medical care of patients with IBD ignores. A question that goes unanswered is why IBD has increased dramatically including it more frequently occurring in children along with variations such as Eosinophilic Esophagitis, Gastritis and Colitis. Whereas Medicine and Alternative Medicine focus on “treatments” as opposed to causal factors, the question of why IBD has increased goes mostly unexplored. IBD Research continues on the same futile path focusing on the development of newer, more dangerous drugs including the so called Biologicals e.g. Humira, Remicaide and newer variants like Entyvio. These are advertised daily on television indicating the lucrative marketplace that has been created. These toxic medications carry serious risks including cancers such as lymphoma, the development of other autoimmune disorders and reduced resistance to infections including tuberculosis. How could they not do so when their function is to turn off a portion of the immune system nature gave us for protection? Older drugs with their own long list of toxic effects e.g. prednisone and methotrexate continue to be administered in combination with the Biologicals” adding to the risk for destructive side effects. When these poisons (as physicians often refer to them among themselves) fail, as they ultimately do in our experience, the patient is frequently instructed to undergo surgery to remove portions of their small and/ or large intestines, or the entire colon ignoring causal factors. New issues are created and additional drugs and surgeries will soon follow. The amount of human suffering, despair and staggering financial costs incurred as poisons are administered and body parts are removed is mind-boggling. I have seen it regularly for over 40 years with desperate patients crying to us for help after drugs, surgeries and alternative medicines have failed. None of the antics foisted upon patients with variants of IBD address causal factors any more than covering the temperature gauge in an overheated car solves the overheating problem. The car will eventually be seriously damaged. The same holds true in the human realm with non-causal based, non-health based treatments. It is not simply the wrong kind of treatments…it is the idea of “treatments” that is incorrect in the first place. The alternative medical group follows the main medical show with their own mischief. A plethora of treatments are exhibited which are also unrelated to causal factors. Supplements, colonics, IV vitamins, ionic footbath “detoxification” and a slew of other often injurious treatments are pushed. The words “natural, progressive, or “alternative” are bandied about but causes remain ignored. Are they less dangerous than the poisons of the pharmaceutical houses? Perhaps… but these alternative medical treatments also fail to address causal factors and thus allow the patient to descend further into illness. That too is dangerous. A more recent genre of practitioners referring to themselves as “functional” medical practitioners has emerged over the past decade. After a weekend practice building seminar or two new products, supplements, lab tests and frequently bio-identical hormones are added to the drugs and other therapies already employed often in hope of obtaining leverage in a competitive market. They frequently promote the much-overused term “Holistic.” Years ago this meant something but today is bandied about as advertising lingo. Functional Tests are sometimes employed to justify prescribing supplements. Some of these tests when understood and used correctly have value and have been employed by some older practitioners such as myself for decades to our patient’s advantage. They must however be appropriately chosen, interpreted and applied to be of value, a fact I have repeatedly stressed in lectures to students and physician groups I’ve lectured to. No one acquires IBD due to lack of pharmaceutical agent or supplement. Conversely we will not get well from their employment while allowing underlying issues to remain. What we need is not medicine nor alternative medicine but rather an alternative to medicine. Stepping back a moment let’s take a broader look at the picture. As a person trained in Chronic Disease Control and Epidemiology and as an independent observer looking beyond the Medical Matrix including the “Alternative Medicine Crowd that has an iron grip on our nation, I see fundamental errors with the ways we live that have contributed to the rise of IBD. Disorders including IBD afflicting us in large numbers today are fairly recent occurrences certainly in terms of their current prevalence. Some like to say that they “believe in Western Medicine and Science”. There is nothing “scientific” in manufacturing and applying pharmaceutical potions to suppress symptoms without addressing causal factors. Answers to chronic diseases like IBD will rarely if ever be found under a microscope. Decades of “research” costing billions of dollars has proven the futility of relying on medical research to solve issues related to the maladaptive responses that our lifestyles produce. We fail to recognize that medicalizing so many of life’s problems like IBD is missing the point. It is the causes of our maladaptative responses that need to be addressed not the prescribing of drugs, potions and pills. Our course most Medical Practitioners would sneer at any suggestion that would draw attention away from medication and towards the mediation of our maladaptative responses. Rather than developing more drugs and therapies we must study the nature of the factors that produce health not simply how to “treat disease.” The reversal of IBD requires the provision of health giving elements and practices designed for the patients needs. This is part and parcel of mediating maladaptive responses. The clear identification of causes requires time, effort and patience, contrary to the practice of physicians running in with a patient’s chart and quickly obtaining their symptoms to plug them into a disease entity. The IBD patient enters a world few escape from…ongoing physician visits, colonoscopies, CT scans, biopsies, endoscopies, lab tests… all to justify the use of pharmaceuticals, insurance billing and to measure the condition as it worsens which under medical care it almost inevitably will. The treatment of disease is not the same as reversing chronic disease through health building measures which takes experience, time and patience on both the doctors and the patients part. You cannot run 40, 50 or as some doctors brag, a 100 patients per day through an office and have time to uncover the causes of the IBD manifestations in each person. My associate and I working together with each person can properly care for six to ten patients per day, which equals three to five patients per doctor per day. The patient’s life must be thoroughly explored. Their upbringing, trials and tribulations, medical care, occupational background, travels, the home life and factors involving their daily habits over the years must be explored not dispensed with casually as “lifestyle factors”. The necessary physical examination and laboratory studies must be performed according to individual patient needs. This process we refer to as the period of discovery and take two to three weeks before even beginning the outlining of initial recommendations to the patient. As stated, I see IBD as a maladaptive response. Maladaptation to food ingested. Maladaptation to stress patterns and diet habits that have led to digestive mayhem and insults to the microbiome. Maladaptation to the patient’s social, work and home life. Maladaptation to sleep patterns and light exposure. Maladaptation to a digitized, electronic world of cell phones, lap tops and Blue Tooth connectivity a world where multi-tasking is the norm and standards of what are and are not appropriate behaviors have become increasingly blurred. Maladaptive responses are piled on top of the patient’s genetic heritage. Since environmental factors can turn the expression of genes on and off, the patient’s genetic background need not be a reason for despair. Many of our patients with IBD who have obtained excellent health had strong family histories of autoimmune processes. Attention to the causal factors involved in turning those genes on and the Re-Creation of the person’s body making use of that information, allows a new, healthier, well-balanced physical body to emerge. Maladaptation responses manifest themselves in many ways including IBD as well as the plethora of allergic and autoimmune issues now prevalent in our nation as seen in the rising incidence of eosinophilia issues, asthma and other allergic problems. Finding the answers for each patient requires more than simply naming symptoms and prescribing drugs or therapies. Each patient must be thoroughly interviewed. Laboratory studies must be chosen appropriately and interpreted and applied correctly. Patients have to become active participants and this requires retraining which is not always simple. Some new patients are just looking for another form of treatment thinking that even though they’ve had many different types of treatments prior to seeing us which did not work they simply require a different one. For most, however, it is refreshing to find a clinic where identification of and addressing of causes is paramount. For a few the process requires too much effort… and it does take effort. The patient’s cellular make up has to be re-created and this requires taking on new habits and discarding old, destructive ones. Those wanting to get well without a thorough rehabilitation will continue on the treatment train. For those individuals the Medical Matrix has designated them correctly… their disease will be a chronic one lasting their entire lives. For the patient willing to take up the challenge of overcoming IBD not simply managing it “chronic disease” the road can be difficult. The destination, however is disease reversal, the construction of health and a pathway to vitality, comfort and independence.